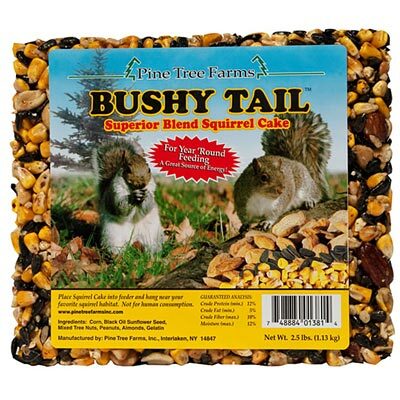 Keep squirrels fed and happy using the Pine Tree Farms Bushy Tail Squirrel Cake. Offering squirrels their own food can sometimes keep them away from your bird feeders, allowing both animals to dine. This convenient seed cake features squirrels' favorite foods, such as corn, almonds, sunflower seed, and other nuts. The block is held together with gelatin, for a great alternative to offering peanuts in the shell or corn on the cob. Place this unit into your existing Pine Tree Farms Bushy Tail Large Cake Feeder (not included) or other large seed cake feeder, or place it on the ground or a platform for the squirrels to access it. Feed squirrels and other wildlife in your garden with this Bushy Tail Squirrel Cake. Made in the USA. Note: This case pack includes 8 Pine Tree Farms Bushy Tail Squirrel Cakes, 2.5 lbs.